Our second week at the Quaker Intentional Village – Canaan has been filled to the brim with good things. We were treated to breakfast in Chatham with Jens, one of the community founders, and Dianne, a good friend and advisor of the community. I had French toast for the first time, and Adrian barely survived chowing down on a pile of blueberry pancakes. Determined to actually learn something about gardening, we’ve been borrowing books and, after some help from Hana, we can now tell our golden rod from our pig weed. The weekly potluck on Friday featured super tasty kale salad, and was followed, at our suggestion, by games. It was great to have a proper laugh! We played Spot It and Apples to Apples, and we’ve discovered there are Settlers of Catan fans in the community! On Sunday there was an Old Chatham Meeting picnic at Powell House, featuring home brewed kombucha (a fermented drink that tasted like flat fruit beer – odd but nice) and swimming in the pond (Adrian, not me!). We were also disproportionately excited to find Divine chocolate on sale at a local farm store. We’ve started planning the rest of our time here, with trips to Cape Cod, Boston, NYC and maybe DC and Ohio in the pipeline. That’s our post-card bit. Now to what Adrian refers to as my ‘sermon’, although I prefer ‘reflection’ or ‘Mark speaks his brain’. Either way, you should keep reading! 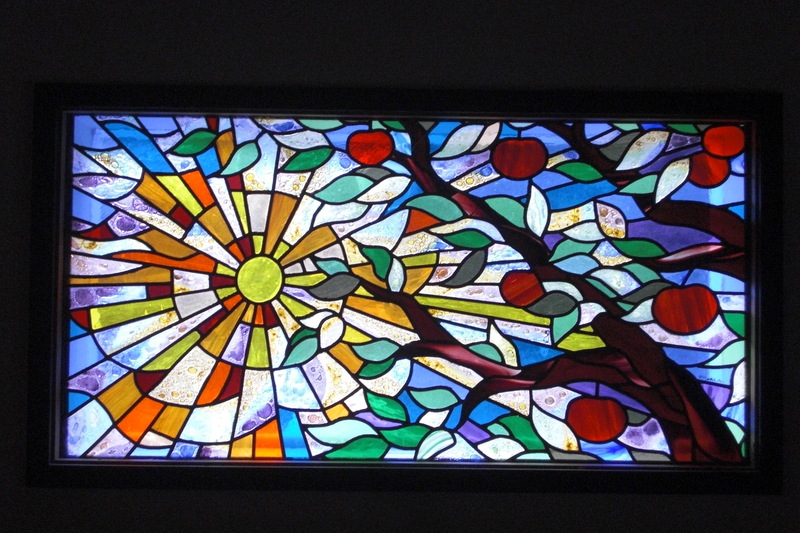 The stained glass window in the Farm House moufraj. To create a village setting that values and engages participation by people of all ages, expands our experience of family, and supports our expression in the world. To live in unity & harmony with the earth by considering the near and far environmental impact of our actions while striving for thrivability. Their work as a community is guided by and measured against these intentions, and provides a constant challenge. On Saturday morning we were chatting over buckwheat pancakes in Jens and Spee’s kitchen. As we helped ourselves to maple syrup (from the community’s own maple trees), we talked about how far we need to go to extract ourselves from the current economic order (referred to in intention 3). Are we able to sacrifice the comfort and convenience that our oil fueled economy temporarily provides? Can we willingly embrace declining standards of living as we approach peak oil? Are the methods of farming used in the community truly in line with intention 4? QIV-C’s explanation of Quaker Business Method. The Israelites exchanged faith in God for faith in Empire, bringing with it conscription, armaments and economic injustice. Empire is born out of mistrust in God. As part of the Covenant, Israelites were asked to trust God to the extent that they should let the land lie fallow for one year every seven years, trusting that they would still be provided for. Can we imagine trusting to that extent? Who do we trust to provide for us? The state? The market? An oil based economy? The writer of Revelation exhorts Christians to come out of Babylon, using one great empire as code for another – Rome. The Church is called to withdraw from an empire that demands our allegiance on pain of incarceration, violence and even death. How can we begin to do that? QIV-C’s Quakery adaptation of a kanban board. The Quakers have developed a way of making decisions that is not of the Empire. The Quaker Business Method seeks the will of God in all things, with deep listening as the highest virtue rather than swiftness or expediency. Decisions are come to by the whole group agreeing to the ‘sense of the Meeting’, rather than a majority vote. If clearness can not be reached on an issue, then it is set aside for another time. Nothing is forced. We were privileged to be a part of a community meeting on Saturday that used Quaker Business Method. QIV-C have adapted the Kanban method as way of ordering and clarifying the discernment process, which I found very helpful! A first step in trusting God is to let God in on how we make decisions. Then we might have the courage to begin trusting God in other areas of our lives. I’ve got a lot more to say about faithful living, especially concerning prayer, but this post is already big enough. I’ll save it for next week. A green heron and terrapins on Sutherland Pond. A swarm of bees occupying a hive on the land. Eating honey comb fresh from the hive. Not quite an encounter, but there are rumours of a hog-nosed skunk in the area! Mark – fascinating, as always. This time what has most spoken to me is the light that QIV-C have thrown on the Quaker Business Method. In particular, the first visual, the flip-chart with the diagram that explains it, is excellently helpful. And the bit that is essential and which is not implemented in many places around me is the Standing Aside. I’ve always been suspicious about the way people around me talk of Unity. What they seem to be saying in effect is that when the Bloody-Minded people in the room have stopped objecting, you’ve got a decision. For them, the Quaker Business Method is a way of handing power to the Big Egos: for any of the Big Egos can veto anything by pointing out that we are not in Unity. Luckily, I know places where it works differently, and for me it is a joy to participate in their Meetings. 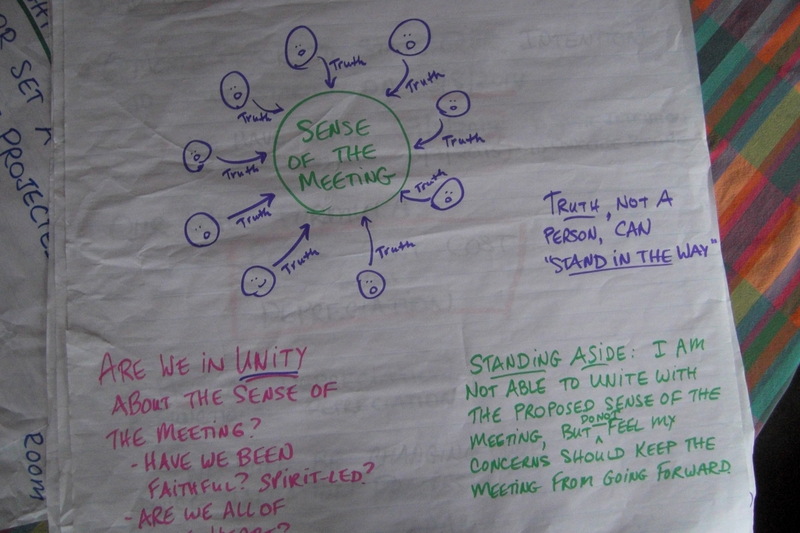 I realise now, because this flip-chart diagram helps me to articulate it, that what is happening is that everyone is having their say and then some, with good discipline to the acts of careful listening both to other people and to what lies in the silence between all the people, are Standing Aside. They are saying to themselves “I, my ego, am not convinced but my ego is being laid down because of the discernment of others and I am disciplining my ego to their discernment”. I’ve done it lots myself. Decision-making can actually move very fast and succesfully if you are a jelled group who have developed trust in each other and in that process. On one occasion, very memorable for me, I did not Stand Aside. I threw a wobbly and kept throwing wobblies, and it changed policy. It still happened fast, though – we must have made that decision in about 10 minutes. I was shaky afterwards, uncertain whether I’d done the right thing to be so insistent. I have no idea where it came from. It was only months later when chance remarks from others made me realise that others were glad of the outcome and it had probably been right. Interestingly, in the places where it works and which I find joyous, people do not use the vocabulary of Unity. They get it but don’t have a way of speaking about it, that is, they know about how to get to true Unity and about Standing Aside but don’t have the words to articulate it. Whereas the ones who say “Friends, we are not in Unity” and write minutes like “We are not in Unity about repairing the roof”, are people who don’t get it and are play-acting, like a children’s tea-party with pretend cups and pots of tea. Moving on, I would love to know more about how QIV-C order and clarify the discernment process. The Kanban-like process they use seems really good – can you say more about how it works? Thanks Imran! 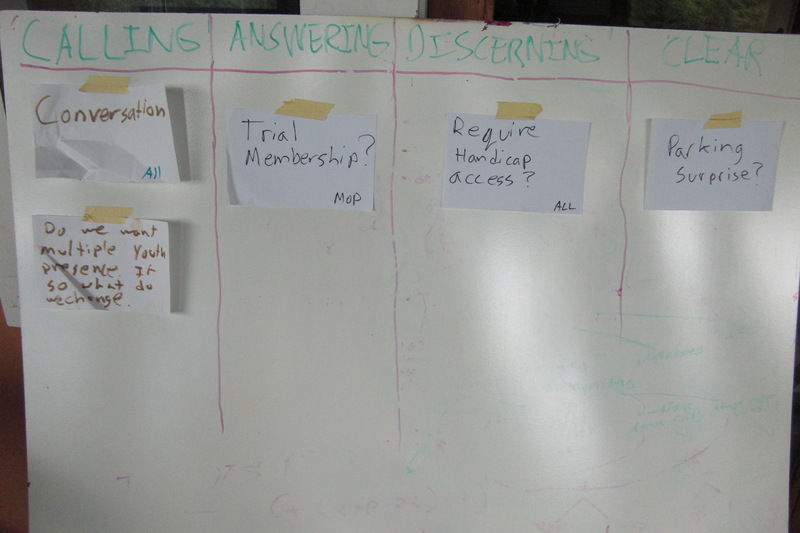 I can’t say I understand the Kanban process beyond the visual handle it gives on the discernment process. One of it’s advantages is that everything the community is tackling or thinking about can be acknowledged without that meaning something has to be done straight away (as in the ‘calling’ column). You can see the sifting process. With a linear agenda you follow a preset course and there’s a pressure to get to the end and tick everything off. With the Kanban board you address the biggest priority and and anything that’s not addressed remains on the board till the next time. Some people in the community find the kandan-style very exciting, others are more ambivalent, but the meetings I’ve witnessed have worked very well.